Lauren Frisch | UAF Mar 27, 2018. New research involving a University of Alaska Fairbanks scientist suggests that social behavior of salmon and other fish is an important puzzle piece that has been missing from fisheries conservation. Collective movement, which is the study of why and how animals move in groups, can explain many aspects of fish behavior. It may influence when juvenile salmon head out to the ocean or how fish travel in schools. But many of the concepts behind collective movement are not well understood. UAF College of Fisheries and Ocean Sciences professor Peter Westley is part of an international team of scientists that has been working to consolidate information on the topic and explore the implications of collective movement on the ecology, evolution and management of species such as Alaska salmon. Modern tagging practices and statistical tools have increased the capacity for researchers to track and analyze movement trajectories for many animals at once. But increased research on collective movement was also catalyzed by a fundamental curiosity — both within the research community and more generally — about how and why certain animals move together. The results of this research have even infiltrated the world of superheroes: the flying bat scenes in the Batman movies were created with collective movement models. Just as people often make decisions based on social factors, many of the choices that salmon make are driven by group dynamics. Since this topic is not well understood, it is not often considered by fishery managers. “Changing our thinking to incorporate social dynamics into this understanding of how populations move around is critical to making the best decisions about their management,” Westley said. Social data reveal that certain species, such as northern cod, cluster when population sizes drop and that juvenile salmon start the long journey to the ocean earlier when they live farther inland. Westley explained that incorporating data like this into decision-making may help managers target or avoid species.Other studies on movement ecology indicate that salmon may be particularly resilient to regional environmental change. Westley is part of a research team that revealed that salmon stray from smaller groups at higher rates than they stray from larger groups. This happens because smaller groups of salmon have less information to share with each other and work from, so their ability to choose the correct path home is reduced. 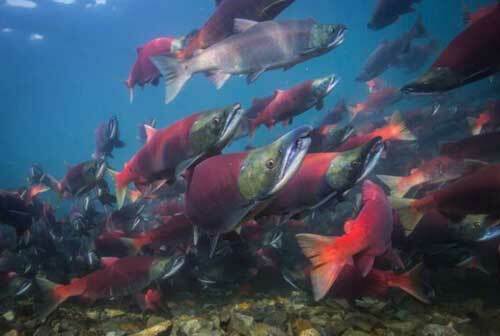 If an environmental disturbance causes a new habitat to open up, it will quickly be colonized by straying salmon. Many other species of fish, birds and mammals have similar evolutionary strategies that help them adapt to environmental change. As one habitat becomes increasingly unlivable, species will slowly move and colonize a new habitat, and evolve to be well suited for that habitat instead. This research is highlighted in a special themed issue of the academic journal Philosophical Transactions of the Royal Society B, which was organized by Westley, Santa Fe Institute’s Andrew Berdahl, University of Glasgow’s Colin Torney and Oxford University’s Dora Biro. The special issue delves into many more topics in movement ecology and collective animal behavior.